Affluence, influence, blue blood, style, luxury…that’s what a common man would associate with polo. But I realized that there are places where you didn’t have to be a somebody to play polo. Places where people played the game for the sheer thrill of the game, the way it was meant to be played. The historian Tabari mentions, polo being originated in Persia. 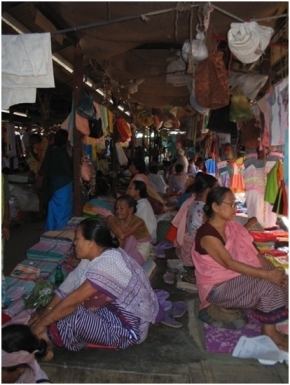 Many believe the game to have originated in Manipur in North East India. The British soldiers first witnessed this game in the Cachar district of present day Assam, which was once ruled by a Manipuri king. The game moved to the neighboring state-Assam, and the British tea planters and soldiers picked it up in the 18th century. Many claim, the British gave the world polo. Yes, they added the splendor and yes, they played a key role in popularizing it. 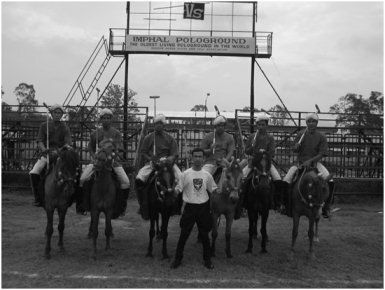 But to see polo in its pure form, I had to visit Manipur. Manipur is a landlocked state in north eastern India, sandwiched between Assam, Nagaland, Mizoram, Tripura, Meghalaya and Myanmar. That’s one of the reasons why the game didn’t spread rapidly in ancient times. People seldom travelled beyond the mountains surrounding the region and the invaders found it difficult to conquer this area due to its rugged terrain. Sadly, not much is written about the Manipuri pony. It doesn’t get much attention as other indigenous breeds like the Marwari or the Kathiawari. Mr. Buddacharan Singh, the president of the Manipur Equestrian Association enlightens me about the Manipuri pony and the government’s efforts to breed these animals. 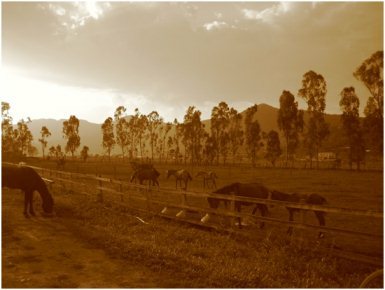 Set amongst the beautiful foothills of the Himalayas, lies the Manipur Horse Riding & Polo Association’s pony breeding farm, on the outskirts of Imphal. Ponies galloping in the meadows, the familiar smell of stables, and the sight of riding arenas, was a sort of a homecoming to me. The Manipuri ponies are believed to be the original polo ponies. They are sturdy, sure footed like most of the mountain ponies and have lots of stamina. The polo ponies used all over the world are changed after seven minutes or a chukker as they get exhausted. The Manipuri ponies needn’t be changed and at times the games seem to go on for eternity. I marvel at the size versus stamina equation. 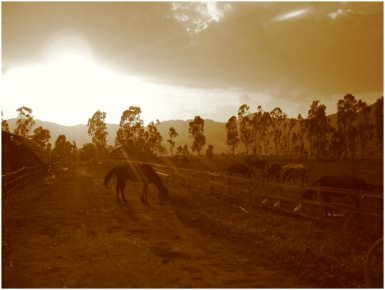 The pony breeding farm in Imphal concentrates on breeding Manipuri ponies but they also breed Thoroughbreds and Kathiawari horses. Thoroughbreds are basically bred for racing and are supposedly the fastest horses. They are also used for other equestrian sports. Kathiawari horses on the other hand are found in the Kathiawar region of western India and are usually frisky horses. I feel it’s time we gave back to the Manipuri pony for what it gave to the world. Although the Manipuri ponies are extremely tough and have lots of stamina they cannot take part in the endurance competition because of their height. That’s why the Manipur Equestrian Association has cross bred a Thoroughbred and a Manipuri. I have a look at the progeny. If this foal inherits the height of a thoroughbred and the stamina of the Manipuri, it would perhaps create news in the equestrian world and perhaps the Manipuri will come full circle. The breed fascinates me. They come in all colours but black and roan are very rare. The Manipuri pony needn’t be shoed and spend most of their time at grass. The farm has around eighty ponies and they are all kept at grass. Manipur has plenty of polo grounds, rather had plenty of polo grounds. A weekly polo ground. A special polo ground. The king’s polo ground. Different occasions- different grounds. I met Basanta and Bimal, at the Imphal Polo Ground. It is the oldest polo ground in the world. I look at the sign board-‘the oldest living polo ground in the world’ I was ruminating over the word ‘living’ on the board. I realized in Manipur, polo is not just a game, it’s a friend, it builds bridges, settles differences. And I thought a ‘living’ polo ground’ justifies that. At the polo ground, I listened to stories about the games these guys had played here. The ones they won; the one they lost and the ones they fought to win. I just love listening to stories about horses and the sheer excitement of the games. I could feel the excitement in the stands, I could hear the cheer of the spectators. Here, polo runs in the blood of these young men. The passion with which these guys tell their stories just takes you back in time. It seems every game played is wonderfully recorded in their minds. To be forever cherished. The sun should set in an hour’s time. I walked around the farm and have a look at the other horses there. Here at the farm, the thoroughbred horses are not ridden at all during the off season. When the games are around the corner, these horses undergo meticulous training and they return with numerous prizes. The Manipur Horse Riding and Polo Association also host a couple of international equestrian tournaments during the year. Interestingly, they exchange horses with the opponent after a couple of chukkers. This, I’m told, is a part of the fair play policies adopted by the locals. So that doesn’t leave room for me to blame my mount for my bad performance! I met the local guys and joined them for a game of polo. 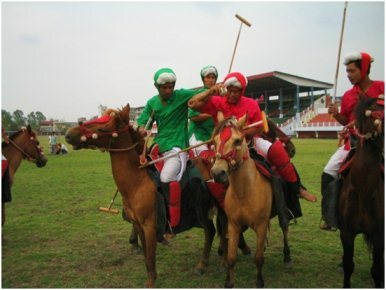 Manipuri polo has two forms. One is called pana, or the freestyle form, which has very few rules. There are no fouls in this format. A rider has the liberty to catch hold of the ball and gallop away to glory. The other riders have the right to knock him down with the mallet. Everything is fair in love and war. I’d rather say, everything is fair in love, war and pana. It amuses me to watch this melee and I burst out laughing, although I wouldn’t want to be a part of this scuffle. The other format of the game is called Shagol Kangji. This is a more civilized form of polo, with a few rules. Thank god! The local guys are extremely proficient riders. They catch hold of the horses from the paddock, saddle them and the next moment they gallop off onto the polo field. The spectators have to be alert during a game. You never know when the ball is coming at you. The next moment you’d hear people asking you to get out of the way. The game would never stop. It feels great to watch the ponies gallop after the ball and hear the thunder of so many hooves. With the mountains on the backdrop, watching a polo match at dusk is a memory that will last me a lifetime. After the match, I joined the guys for a game of polo. I was no match for them. It’s a shame, but I must admit, the number of times I got to hit the ball can be counted on one little finger. But, they gave me a few lessons on polo. 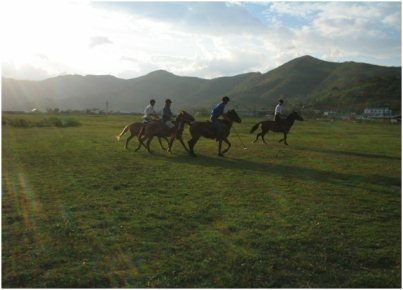 The polo season in Manipur starts around October and continues till May, when the rains come in. I watched plenty of videos of famous pana tournaments, that evening. The local guys were all too eager to explain the game to me and before I knew it, I had so many people in my small hotel room that there wasn’t any space to move. There seemed to be an expert for every aspect of the game. They left no stone unturned. Before a game of pana begins, there are a host of pretty girls who offer a basket of fruits to every rider. For a moment, I was ruminating about the girls in the motor bike races. It’s akin. These girls are elegantly dressed in their traditional dress, which consists of a wrap around skirt called a phaneg. These girls are led into the field by a man who plays a tradition musical instrument called a pena. The pena, can best be compared to a violin. It has hair from the horse’s tail stretched across a frame and used like the wand a violinist uses. After these girls show their respective riders the treat that awaits them after the game, they move out of the field and then the games begin. The blowing of a sea shell signifies the beginning of the game. The sound of the sea shell takes me back to a time when the sound of the sea shell signified the beginning of a war. Pana is no less than a war, with seven players a side. Every time a goal is scored, the sea shell is blown. Before a game starts the number of goals to be scored in the match is decided. If the players can’t score the fixed number of goals, before dusk, then the game carries on the next day. This custom goes on to display the sheer endurance of the Manipuri pony. I think about the huge horses I’m used to riding. Seven minutes-change your horse. And these tiny ponies carry on for hours. After watching a few matches, we all had a debate on the origin of polo. Mr. Tombiraj’s contention was that since Manipur was a landlocked region, in ancient times it would be difficult for the game to have found its way in. Only when the British came to the Cachar district of Assam, they adopted the game. That’s why today, no matter how tall your horse is, a horse used for polo is always referred to as a polo pony. 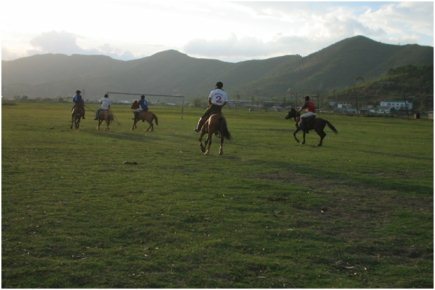 It is believed that polo was played in Manipur even before Christ was born. I don’t know how much of that is true. Wandering in the local markets in Imphal, I came across miniature mallets which were about a foot long. The shop keeper explained that these were mallets for the Gods. In Manipuri mythology even the Gods played polo. Polo playing gods! That’s interesting. It is fascinating to see polo being so closely associated with the lives of the people. They just live the game. Meandering around I realized something peculiar. There were only women around me. I mean, I don’t mind, but where did all the men go? I realized I was in a ladies market or the ema market, which is run only by women. This is the only market of its kind in the world, I guess. Never seen anything like this before. Never will. In Manipur, every village has its own polo ground and they follow a league system, while organizing matches. There are the ‘hafta’ polo grounds or the weekly polo grounds in the villages. The Royal polo ground at the palace is for special matches. The finals take place at the Imphal Polo Ground. Spectators turn out in huge numbers to watch these matches. Even if polo originated in Persia, Manipur is the only place in the world where it is preserved in its original form. In the past many polo teams have traveled to Manipur to play polo with the Manipuris, only to lose and be bruised. In the 18th century Major General Sherer, won a whole lot of polo matches in India. He was so proud of his victories that he challenged the Manipuris in their own game. Consequently, he traveled to Manipur with some of his finest players and his cavalry band. Unfortunately they lost and were shocked to see the way pana was played. The British were used to rules and people having some compassion for their opponents. 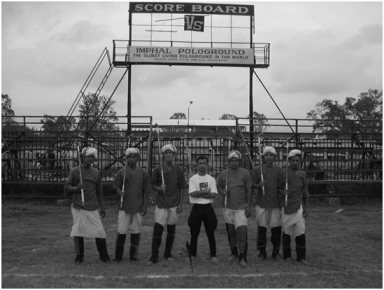 In Manipur, once you are at the polo ground, you play to win or rather you fight to win. Apart from polo, there is another fascinating game the Manipuris play. This game is called Arongbai. Arongbai is a traditional manipuri dart. The style of throwing an Arongbai is similar to the basic polo strokes. It is said, the Manipuri army in the days of yore, spent their free time playing polo and when it was time for battle, they were well prepared with their arongbais. In fact, back then, the tips of the darts were smeared with poison. 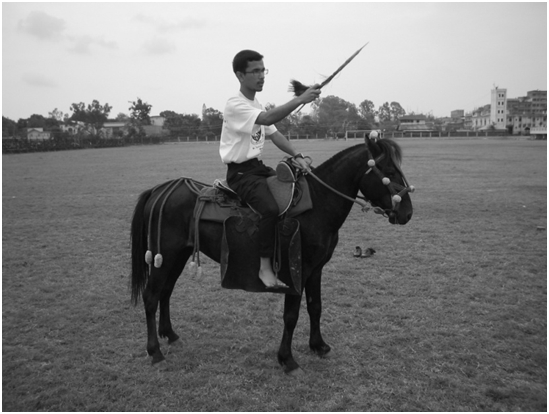 Legend has it that, the Manipuri army used to gallop towards the invaders, who had bigger horses and a larger army. In the final minutes before combat, they would turn around and gallop back. This act used to perplex the enemy, who would take it for granted that that the Manipuris are fleeing the battleground. That’s when the Manipuris would throw their arongbais backward and catch the enemy unaware. Throwing darts backwards and shooting arrows backwards are tactics that the Genghis Khan army used. I suppose they all belong to the same family somewhere down the line. Small horses, exceptional riders and deadly warriors. I guess I see a connection. I try my hand at the sport and discover I’m pretty good at it. The Arongbai is swift and deadly. I engage in some target practice and realize that I really enjoy this sport. In fact, I was spellbound when I realized that the Manipuri saddlery was so designed that one couldn’t ride these ponies with shoes on. The stirrups were narrow and can accommodate only the rider’s bare feet! I love the indigenous horse breeds of India primarily because of the energy these horses have. Most of them are hot blooded and frisky. The Marwari was breed for war. I have been told that the British couldn’t ride the indigenous horses and had to import docile horses. I have experienced a couple of indigenous breeds hell bent on throwing me off. That’s where the challenge is. That’s why I love them. Riding in Manipur will always be special for me. The passion with which the locals play the game leaves me spellbound. Here, it’s alright if you can’t converse in English. It’s alright if you are not on the sartorial list. Here, nobody is flaunting their Louis Vuitton bag or their Gucci shoes. Friends, foes, strangers- everyone’s welcome. It’s what a game should be like. Here, the people see a friend in a stranger. After I had my share of polo, the sun was just about to set behind the majestic mountains. One of the guys asked me if I’d like to gallop my horse into the sun. I couldn’t think of a better way to end my day and so there I was with these Manipuri horsemen, galloping away towards the setting sun. I just loved each and every moment of that gallop; the wind whistling in my ear; sound of the hooves under me; the company of traditional horsemen; and the setting sun. I wished the moment would never end. Galloping these majestic beasts gives me a thrill equivalent to no other. These are the moments that take my breath away. These are the moments that I live for.